Here’s three buggies that were destined for my craft fair. Well, they almost made it there! :-) When I started them, one was going to be poplar and pine, (like my last one), one cherry and maple and one oak and walnut. This is the poplar and pine one. Pretty much straight forward but it never made it to display. It was spoken for before it was even finished. A friend wanted one for a gift so it was put back. This one, the cherry and maple one, started looking nice. I had a door I found about a year ago from the 1890 to 1900’s and had it put back. I decided to use that door and keep this one for myself. It even has touches of brass on it. This one, oak and walnut, really changed during the build. It just kept looking better and better! When I finished it, I decided it looked just too nice to sell. (Believe it or not). I wanted it to go to some one really deserving. I gave it to my Son. After all the photo work he does for me and even stayed with me during the entire craft fair I felt it should go to him. He was really happy to get it too and was surprised when after he took the pics, I said here. Even though they never made it the table, I had a lot of fun building these which is the point of wood work. I even made my own wheels, something I need some practice on. Be glad that your children actually appreciate what you do too! These are really quite beautiful and charming Jeff. The craftsmanship is superb. Nice Job! Great job, Jeff! And sounds like they’ve found a lot better homes than if you’d sold them to strangers. 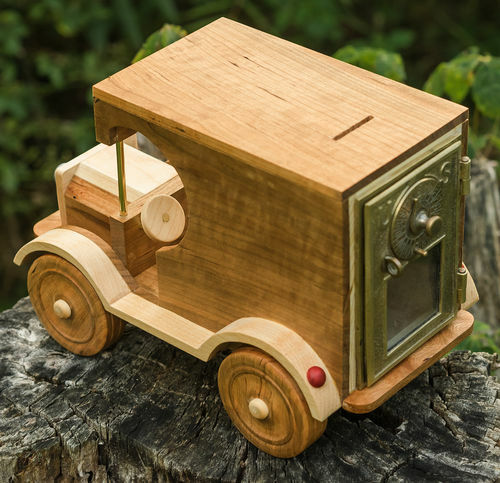 Really nice projects and love the way the different woods change the character of the truck. I made something similar but a lot smaller for my HO train layout! Those are great Jeff. They look like little Brinks trucks. Nice work! Super job Jeff. I have a couple doors again and I may copy this idea. Just like a Brinks truck. Well thought out. Awesome project! 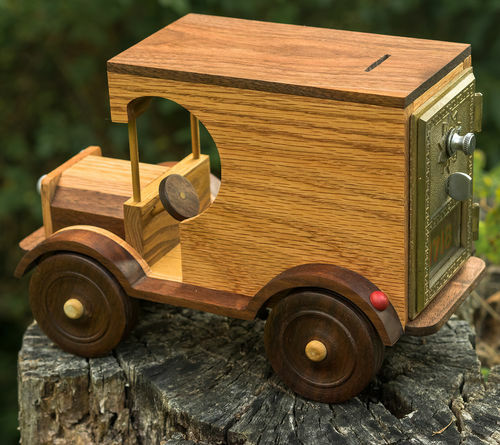 Very well combined toy car and ’’piggy bank’’. Nicely done. I’ve been toying with making some models ( no pun intended) . 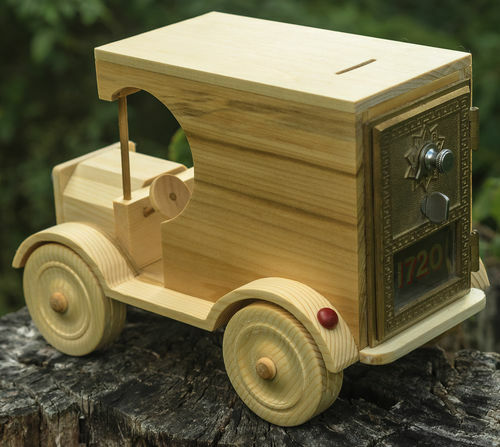 Using the mailbox doors is a great idea. That’s a great idea for those doors. So cute. Well done sir.